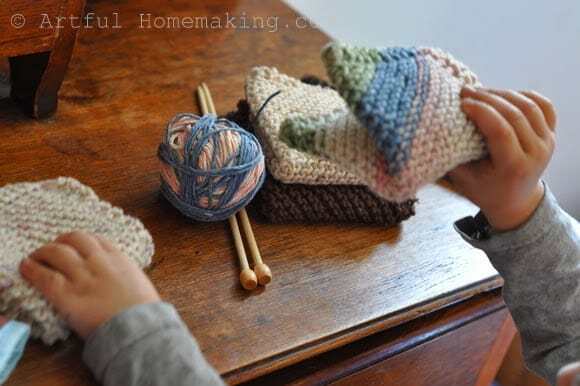 Maybe it’s time to branch out to a new pattern…I just keep knitting these dishcloths! They are so easy and “mindless” that I can work on them anywhere and they still turn out just fine. Most of these were made while driving (I wasn’t the one driving!) or while watching a movie. I’m almost finished reading The Mom Walk. It’s been a very encouraging read. Full of grace for moms. these are my favorite things to knit. we use them in the bath and for dishes. Thank you so much for letting me know that you like the pattern! I didn't create it (it seems to be a public-domain type of pattern, handed down from one knitter to another through the years), but I do love it, too. The idea of you knitting while actually driving cracked me up. Those cloths are amazing. Do you use some for bodies and some for dishes? They are very useful! Thanks for stopping by! 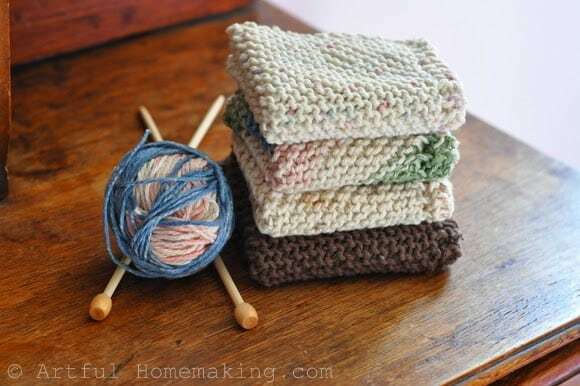 I almost always have a dishcloth going (though I crochet mine). They're easy and you always need more of them! 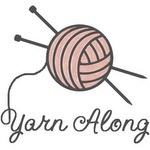 You should check out Ravelry.com. It is free to join and I have some dishcloth patterns I designed on there for free. I could email them to you instead if you want. I agree with you, they are very therapeutic! Blessings to you! Thank you! I think this is a great beginner pattern. Once you get it down, the pattern just repeats itself for quite a ways and then you don't really have to concentrate on it too much. I've been making them for gifts, and it's just fun to have something handmade to give away even though they are very simple. I highly recommend knittinghelp.com and also youtube for help learning to knit, or if you get stuck! Hope your day is blessed! These dish clothes are sooooooo therapeutic! I am glad you reminded me of this pattern. I have been using up my stash of craft cotton and blessing my home with new dc's, what a blessing indeed.